Since Walgreens already had "Vegeta" Killmonger as one of their exclusives, this set just gives us the "Blacker Panthest" suit. The dusty golden details are printed nicely, and end up cleaner here than they did on the 6" figure - it's more obvious that he seems to have leopard spots now. Is he actually going to re-engineer the costume like this in the movie, or is that just artistic license? Comicbook Killmonger used to have a pet leopard named "Preyy" (no idea how you pronounce that second Y), so maybe this is the movie's nod to that? Kind of like how Aldrich Killian had Fin Fang Foom tattoos on his chest? The mask is the same mold as Black Panther's, but it's got the fangier paint on it. If you want to take it off, the set includes Killmonger's El DeBarge hair, and this face has the mouth open and the eyes squinted, setting it apart from the other release. The only two prominent white actors in Black Panther are Martin Freeman, who played Bilbo Baggins, and Andy Serkis, who played Gollum - they're the movie's Tolkien white guys!! Eh, eh? Get it? [You're fired. --ed.] 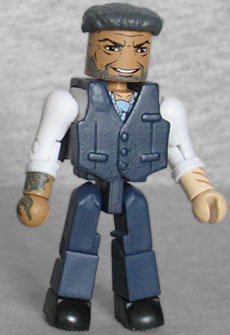 There was already one Klaue Minimate in the National Lampoon's Sokovian Vacation line, but this one wears nicer clothes - a dress shirt and vest - and has a different haircut. His hair and beard are graying, but he's smiling this time. The tattoo remains on his right hand. 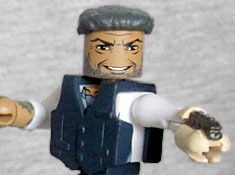 His left arm is a different, lighter shade than the right, because it's a prosthesis. A few straight lines painted on it hint at its true nature: it's really a sonic cannon disguised as an arm. And because Minimates are awesome, the set comes with an interchangeable left arm that's a new mold from the elbow down, showing the hand split in half to reveal the blaster within! Too cool! Killmonger is available in the four-pack boxed set, but Klaue isn't, so you kind of have to get this one. It's not exclusive to either Walgreens or TRU, so you can pick it up at either store. We still can't help wishing some other character was in here. Queen Ramonda? Saw Gerrera? Dude from Get Out? Shuri in her white dress? Casual Dora Milaje? Tribal battle T'Challa? Someone. Marvel Legends addendum: dat (female) body! 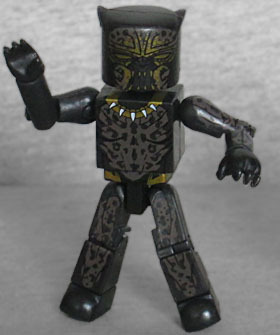 This entry was posted in Art Asylum, Marvel, MMMR and tagged Black Panther, Minimates. Bookmark the permalink.